FSN continued its broadcast of the World Poker Tour’s ninth season with Part II of the WPT Celebrity Invitational from the Commerce Casino in Los Angeles. Of course the event was held to support Chrysalis, a nonprofit organization that helps economically disadvantaged and homeless people become self-sufficient through employment opportunities. If you recall, Part I saw the eliminations of Dinara Khaziyeva in sixth place ($5,000) followed by Damon Schramm in fifth ($10,000). In one of the last hands of Part I, Dan Heimiller opened for 120,000 with only to have Davidi Kitai move all-in for 915,000 with . Heimiller made the call and it was off to the races. The crowd and players were on their feet as the flop fell , vaulting Kitai into the lead. The changed nothing, and neither did the river. Just like that, Heimiller lost half of his stack, and Kitai took over the chip lead with 1,925,000. Here is how the final table looked heading into Part II. First Hand: With the blinds at 30,000/60,000 with a 10,000 ante and the stack sizes relatively small, the players were essentially committed to force the action. In the first hand, George Rechnitzer, who did not play a single hand during Part I of the broadcast, limped with only to have Dan Heimiller raise to 170,000 with . The other two players folded and it was heads up to the flop. Are You Kidding Me?!? : Under the gun, chip leader Davidi Kitai moved all with the paltry only to have George Rechnitzer look down at . You would think Rechnitzer would insta-call with his short stack, but much to the amazement of Sexton and no doubt the millions of viewers, Rechnitzer laid down the hand and allowed Kitai to swipe the blinds and antes. Rechnitzer Eliminated in Fourth Place: In the next hand, Almira Skripchenko moved all-in for her last 560,000 with and again George Rechnitzer looked down at . This time, however, Rechnitzer made the call. Skripchenko, a four-time chess champion, was in big trouble, especially so after the flop added a flush draw to Rechnitzer’s superior hand. On the verge of elimination, Skripchenko needed some major help, which he received as the dealer burned and turned the . Suddenly Skripchenko found herself a 3:1 favorite. The on the river changed nothing and Skripchenko doubled to 1,160,000 while Rechnitzer was left with just 30,000. Rechnitzer was eliminated on the very next hand, earning $15,000. Ones to Watch: In the WPT’s newest segment called “Ones to Watch,” 10 young players were showcased at the Celebrity Invitational. During the segment, it soon became clear that many of the participants were not too focused on the game, instead preferring to have a good time and contribute to the jovial atmosphere. Heimiller Eliminated in Third Place: Dan Heimiller looked down at in the small blind and decided to move all-in for his last 760,000. Davidi Kitai needed to call 680,000 more from the big blind, which is what he did after peeking down at . “That’s the hand I was hoping you’d throw away,” Heimiller said after discovering the bad news. Heimiller stood from his chair and watched the flop come down , giving him just a 5 percent chance of winning. However, the on the turn gave Kitai two pair and left Heimiller drawing dead. After the was put out on the river for good measure, Heimiller made his exit from the WPT Celebrity Invitational in third place, albeit $20,000 richer. Along Came Polly: In regard to an interview with Davidi Kitai, co-host Vince Van Patten jokingly asked, “I’m confused, was that Davidi or was that Hank Azaria in [the movie] Along Came Polly?” We admit, they do sound very much alike. Heads-Up Play: Davidi Kitai entered heads-up with 3,000,000 in chips to Almira Skripchenko’s 1,450,000. However, Skripchenko was able to double into the chip lead after picking up and getting it all in preflop against Kitai’s . The board ran out and Kitai was suddenly behind. The two continued to battle back and forth, throwing in raises and reraises to swipe the large blinds and antes. In one hand, Kitai limped with and Skripchenko checked her option with . When the flop fell , Skripchenko check-called a bet of 100,000 from Kitai, leading to the on the turn. It was the gin card for Kitai as he hit his gut-shot straight. Skripchenko check-called another bet, this time 240,000, and the hit the river! Skripchenko had hit trips and checked. Kitai bet 640,000, Skripchenko made the call, and Kitai once again claimed the chip lead. 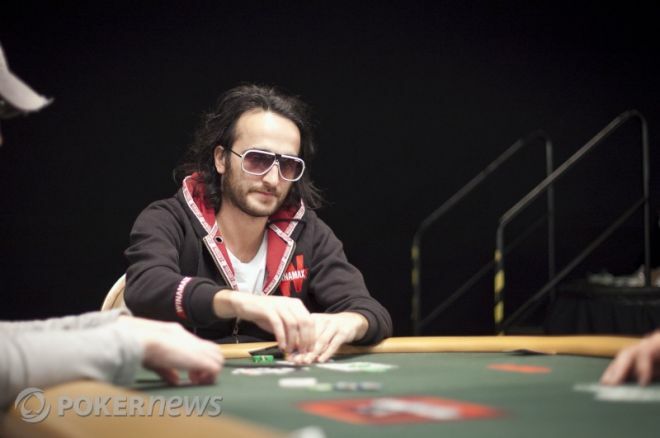 Final Hand: Davidi Kitai looked down at and instantly moved all-in. Almira Skripchenko nonchalantly called off her last 1.3 million with and was a 57 percent favorite to win the hand. Her chances increased to 76 percent when the hit the flop, giving her a pair of aces. All she needed to do was dodge a three, queen, or running cards to double. The dealer slowly burned and turned the ! Both players kept their composure as Skripchenko suddenly needed help on the river. Unfortunately for her, the provided none and she was eliminated in second place for $50,000. Meanwhile, Kitai became the WPT Celebrity Invitational Champion and captured the $100,000 first-place prize. To learn more on Kitai's victory, check out his winner's interview with Kimberly Lansing. Tune in Next Week: FSN will continue its broadcast of the WPT Season IX next Sunday, so be sure to either check your local listings. If you love poker, be sure to follow us on Twitter and like us on Facebook for up-to-the-minute poker news.